Veteran leftist politician Andres Manuel Lopez Obrador has slammed President Enrique Peña Nieto’s plans to spend over seven billion pesos on a new presidential jet plane. Lopez Obrador, who lost the 2012 election to Peña Nieto, called for the president to instead use the funds to aid the communities in Guerrero that were devastated by last month’s severe tropical storms. “I propose directly to Enrique Peña Nieto, and I hope that he listens, that he cancels the purchase of a presidential aircraft for seven billion pesos and that this money is used in full to support the reconstruction of Guerrero,” Lopez Obrador said, describing such expenditure on a presidential jet as an insult to both Mexico and the state of Guerrero. The total cost of purchasing a state-of-the-art Boeing 787-8 Dreamliner and equipping it for presidential use will be 7.52 billion pesos (584 million dollars) and it will leave Mexico indebted until 2027, according to Spanish-language media outlet Emeequis. A contract for the purchase of the plane was signed by Boeing and Mexico’s Secretary of Defense last November, a month before Peña Nieto took up office. 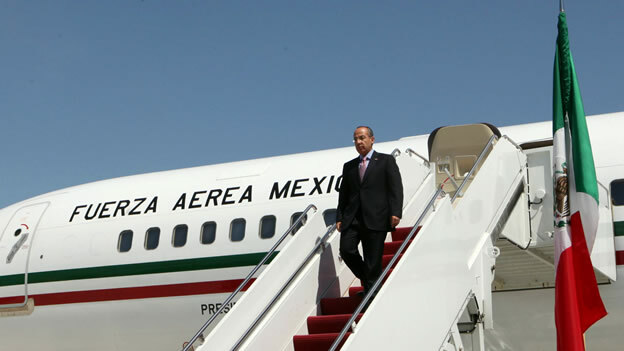 Mexico’s current equivalent of Air Force One is the Avion Presidente Benito Juarez, a Boeing 757-225. It has room for 66 passengers and 15 crew members and includes a private office, bedroom and bathroom for exclusive use of the president. During his 50th birthday celebrations in August 2012, Peña Nieto’s predecessor President Felipe Calderon reportedly told guests that drug kingpins had threatened to bring down the presidential plane when he was on board. Calderon, who launched a major offensive against Mexico’s drug gangs upon taking up office in December 2006, was once warned that his plane could come under attack during a planned trip to Tamaulipas, but opted to go ahead with the flight. “Before the trip I recorded a message for my children where I told them that in case something happened to me I wanted them to know their dad was doing what he believed in,” Calderon said, according to Spanish-language daily El Universal.